Two lives show that a truly integrated existence—a life-long process of personal and political transformation—lies within the reach of everyone. 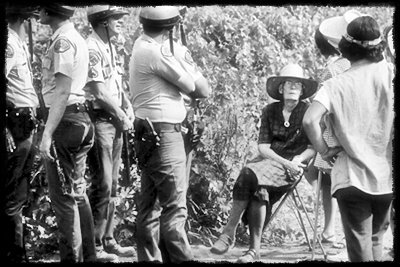 Dorothy Day before her last arrest at a farm workers picket line in Lamont, California, in 1973. Credit: http://rosemarieberger.com. All rights reserved. The lives of Dorothy Day (1897-1980) and Thomas Merton (1915-1968) illustrate that wholeness does not come easily. It emerges through the events of our lives, and often from different directions. Day began with social commitment and gradually found that the Catholic faith offered her the grounding for her lifelong work with the poor. Working from the opposite perspective, Merton ‘left the world’ in 1941 to enter a Trappist monastery after a tumultuous adolescence and early adulthood. Slowly in the 1950s, he began to realize that he was deeply united to all persons and that their concerns must also be his. But both of their journeys show that a truly integrated existence—a life-long process of personal and political transformation—lies within the reach of everyone. Dorothy Day was the co-founder of the Catholic Worker movement with Peter Maurin. Born in 1897 in Brooklyn, New York, Day was six when her family moved to San Francisco. All her life she remembered the earthquake of April 1906, and how her mother gave away every piece of clothing (except what they were wearing), and all the food in the house to those made homeless. Later the family moved to Chicago. As she took her younger brother for walks in his stroller through the streets of the city, Day began to notice the poverty around her, and hoped “even then to play my part. I wanted to write such books that thousands upon thousands of readers would be convinced of the injustice of things as they were.” At the age of sixteen she went to the University of Illinois on a scholarship, where she joined the Socialist Party. But a year later she moved to New York with her family. In 1917 Day was arrested for the first time during a suffragist protest at the White House in Washington DC. She met Forster Batterham and they had a daughter, Tamar Teresa, in 1926. During her childhood, various neighbours took her and her siblings to church. When she was a young adult friends described her as “haunted by God.” Later in her life, Day wrote that “All those years I believed. I had faith. The argument of authority, of conscience, of creation—I felt the validity of these.” But after she moved to New York and became absorbed with Socialist groups and literary friendships, religion appeared to impede her work for a just society. However, when Day fell pregnant, she discovered to her surprise that she had a powerful desire to pray. Her increasing search for God brought her into conflict with her partner. When their daughter was born, Day had her baptized, and after an explosive argument Batterham left her. Now she was free to become a Catholic, but as a member of a church that she and Batterham had regarded as a repressive institution. Nevertheless, Dorothy was attracted to the Church because of its communitarian nature. In December 1932 she was sent to Washington, DC by Commonweal magazine to write an article about a hunger march that had been organized to call attention to the deepening poverty of the Great Depression. She felt frustrated that her new faith didn’t seem to connect with the deprivation she saw around her. After the march she went to the unfinished Shrine of the Immaculate Conception and prayed desperately for a way to combine her faith and her social conscience, a way to use her talents for the poor. When she returned to New York, Peter Maurin was waiting for her at her apartment. Together they began the Catholic Worker movement in 1933. Its first initiative was direct service to the poor through bread lines and houses of hospitality, staffed by volunteers and open to anyone in need. The Catholic Worker newspaper, which she edited, gave her an outlet to write about social justice issues, the church, and the daily life of the houses. Farming communes were also envisioned by the movement, as places where people could learn to be self-sufficient. Day was a life-long pacifist, and maintained this commitment throughout World War II. She protested against nuclear weapons, air raid drills in New York in the 1950s, and every form of injustice throughout her long life. Her last arrest took place in the 1970s in California, for supporting farm workers who were being organised into a labour union by Cesar Chavez. Dorothy Day and Thomas Merton were contemporaries, and The Hidden Ground of Love, a collection of Merton’s letters on social concerns, contains twenty-three letters written by him to her. Merton was born in 1915 in southern France to parents who were artists. His religious upbringing was occasional and scattered. His mother died of cancer when he was six, and during the next few years he travelled with his father and brother to France, England and the United States, attending various schools while his father painted. Merton’s father also died of cancer when his son was sixteen, and after completing secondary school in England, Merton went to Clare College, Cambridge. This proved to be a disastrous year, and after he fathered a child his guardian sent him to the United States. There he began to settle down, and Merton earned his Bachelors and Masters degrees in English from Columbia University in New York. His informal study of medieval philosophy helped him to realise that God was not to be rejected as an old-fashioned idea, and that the arguments for God’s existence still made sense to him as a young man in the 1930s. He was baptized and became a Catholic in November, 1939. Almost immediately, Merton thought of becoming a priest, but he was rejected by the Franciscans. In April 1941 he made a retreat at the Trappist monastery of Our Lady of Gethsemani in Kentucky and was powerfully attracted to the austere monastic way of life he found there. The Trappists accepted him, and he entered the monastery on December 10, 1941. After making his vows he was ordained as a priest in 1949. He died unexpectedly in Bangkok, Thailand on December 10, 1968. Merton’s monastic life began in a very traditional way, and like other monks it was expected that he would be hidden from the world except to his family and a few friends. But as a gifted writer, he became a public monk first through his autobiography The Seven Storey Mountain (1948), and then through a steady stream of other books on spiritual themes. Throughout his monastic life his desire was always for more solitude, and in 1965 he began to live as a full-time hermit on the grounds of the monastery. Increasingly, as Merton spoke from solitude to the problems of the mid 20th century through his writings, his vision began to embrace the whole world: race, poverty, peace, non-violence, and the evil of nuclear weapons. While prayer was always central, he wrote that “it is also an obligation on my part to speak out insofar as I am able, and to speak as clearly, as forthrightly and as uncompromisingly as I can.” As a monastic social critic, his voice was welcomed by many, even though some of those who had been nourished by his spiritual writings were upset that he was addressing the most challenging social issues. His superiors were not always supportive, especially when he wrote about peace and nuclear weapons. The lives of Dorothy Day and Thomas Merton represent journeys to wholeness from different starting points. For Day it was a journey from social commitment to religious faith, which then became the foundation of her life of service to the poor. For Merton it began with a decision to ‘leave the world’ as a Trappist monk, only to realise that he was intimately bound to everyone else. As a social critic he spoke truth to the powers of his day. Our lives are not their lives, but the challenge is the same: to weave what life offers us into a pattern that reflects both real spiritual depth and whole-hearted commitment to the justice issues of our time.